Horseback riders in eastern Massachusetts predominantly ride English style, while those in the western part of the state favor western saddles. Lucky for them, they can rely on the craftsmanship of Keith LaRiviere, who may be the only western saddle and tack maker in New England. LaRiviere is a parachute rigger by training with 37 years' experience as a skydiving jump instructor, parachute rigger, and jump pilot. So why saddles? Blame his wife Jane's need for repair of her horse tack. Keith's familiarity with repairing parachuting harnesses led to his slowly accumulating the tools and skills to work on leather horse tack. "I started out small, basically doing repairs and making headstalls and bridles, chaps and chinks." Inspired, Keith went on to study saddle making with Colorado saddler Jesse Smith and apprentice with New Hampshire harness maker Russ Bigelow. The apprenticeship was a chance to build a show harness for a draft horse and a replica of an 1859 saddle, the one used by US Calvary during the Civil War. 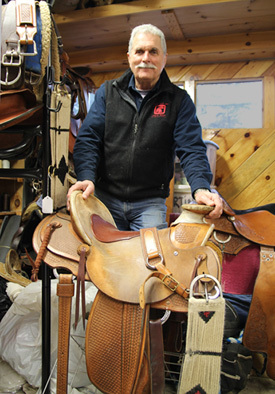 In addition to the two to three saddles he builds a year, Keith repairs old ones with tender loving care. Beyond saddles, Keith has made or fitted several pieces for Civil War reenactors, created harmonica cases, tool cases, and holsters for modern cowboy mounted shooters.